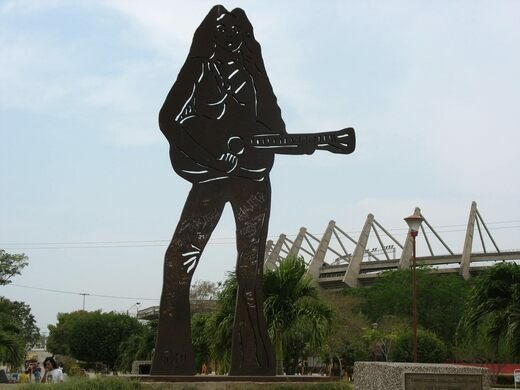 The statue of Shakira in the singer’s hometown of Barranquilla, Colombia bears little resemblance to the pop star. A dangling church built over a Colombian gorge. Enchanting cave with a river crashing through the roof. It was built with Colombian iron. German artist Dieter Patt had the iron shipped to Germany after coming up with the idea in early 2005. Patt, a Shakira super fan if there ever was one, supports many charity projects in Colombia, including the singer’s Pies Descalzos (Barefoot) Foundation. The statue weighs six tons and is inscribed with a quote from Shakira: “When you look at me, think that you too can accomplish what you want.” After spending a few months in Neuss, Germany, the statue was taken apart and shipped to Colombia. Initially the plan was to install the monument next to the airport, but Shakira wanted it to be visible whenever, wherever to the youth of Barranquilla to inspire their own dreams. 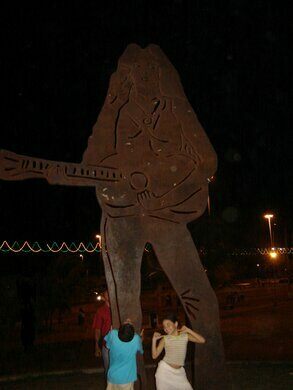 In 2006, the statue went up in Metropolitan Park next to Estadio Metropolitano, a soccer stadium where Shakira has performed. During its unveiling, fire was set to paper wrapped around the 16-foot-tall statue, revealing the iron pop star in all her glory. A benefit concert featuring local performers and regional music and dance groups followed. Explore Colombia's boisterous cities and ancient towns, and spend time with the people who are leading its cultural resurgence. A narrow ghost town built onto a peninsula behind a Colombian Slum. The 17th-century hacienda where Simón Bolívar spent his last days before dying from tuberculosis. There are thousands of tributes and memorials to the King of Rock and Roll, but none quite like this one in a Kraków city park.